“Earth isn’t coming back.” Those are the words an aging Monty speaks at the end of “Damocles - Part Two.” The words have been a long time coming. The statement itself is brought about by McReary’s sabotage, his launching of missiles to make sure the Shallow Valley is destroyed if he can’t have it to himself, but it’s appropriate in the larger scheme of things. Ever since the original 100 landed on Earth, violence and struggle has been all these people have known. There have been tender, joyful, and loving moments in there too, but it’s largely been nothing but survival for Bellamy, Clarke, Octavia, and the others. So many have died along the way, and for what? For a semblance of what it means to truly live? Earth isn’t coming back, and perhaps that’s for the best. “Damocles - Part Two” affirms something we already know about The 100, which is that this show is really good at executing its season finales. This is an exciting, emotional, game-changing episode of TV that not only closes out some of the more troubling storylines of this season, but also sets up a sixth season that could go anywhere. 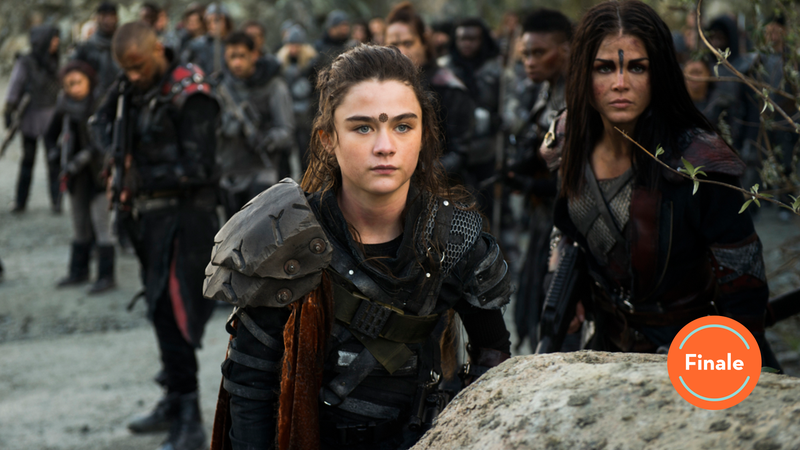 Clarke’s motivations are righted, Kane and Abby get a semi-happy ending, and even Octavia and Bellamy get some much-needed closure after a season that pitted them against one another. The question is, does the finale earn its moments, while also doing enough to right what’s been a season of ups and downs? The short answer: I’m not sure. A short answer isn’t enough, of course, because these are complicated questions. On the one hand, “Damocles - Part Two” is one of the best episodes of the season, and the final 10 minutes shift the narrative in really exciting ways. On the other hand, I worry that The 100 is falling into a pattern of telling lackluster stories for an entire season, and then just blowing it all up in the finale. That’s a simple way to avoid any potential consequences in shoddy storytelling, and this season’s finale leaves me wondering if the show is still capable of telling an overarching, complex, emotionally insightful story like the one in season two. That’s my line of thinking because so much of the early part of this episode is rather paint-by-numbers. Madi takes control of her army and, with a little help from Gaia and the former Commanders, comes up with a new plan to take on McReary and his army. That leads to a whole lot of shootouts and a tense standoff between Clarke and McReary. Eventually, the good guys get the upper hand and everything seems to be fine, other than the fact that during all of this McReary has launched missiles to destroy Shallow Valley. Madi, at the behest of Bellamy, spares the lives of McReary’s people, and everyone hops aboard the ship to flee the last livable place on Earth that’s about to be lit up with fire and fury. The emotional moments here land, with Bellamy talking Madi out of killing McReary’s men with a speech drawing on the history of the original 100 and their time on Earth. Even Emori and Murphy get some time to make up, with Emori refusing to leave the man she loves behind. It’s an exciting, tense first 20 minutes, but it’s still a crescendo coming way too late. It’s a worthwhile payoff, but it doesn’t fix the season’s issues with pacing and jumbled storytelling. And that’s why the final 10 minutes of the episode deserve to be questioned. Are they fascinating and exciting and filled with potential? Absolutely. But is that the only move this show has anymore? Is The 100 only capable of nuking every storyline at the end of the season in order to move forward in a meaningful way? I honestly don’t know what the answer is. I’ll tell you this: when Monty and Harper’s son was introduced, my mind was blown. When they revealed, through video from the past, that they’d kept the group in cryosleep for 125 years, my jaw dropped. When they revealed that they named their son after Jasper, I cried. Everything about those videos, about that final scene with Clarke, Bellamy, and Jordan, is emotionally affective and worthy of praise. But was this not the case last season too? Season four represented a solid recovery after a third season defined by ill-conceived character motivations and storylines, which culminated in Praimfaya and the five-year time jump. Jumping ahead in time is a perfectly acceptable narrative trick, but it can become a crutch, a way of laying waste to the past and avoiding complicated questions stemming from present situations. 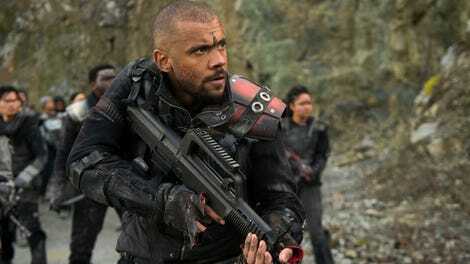 In other words, “Damocles - Part Two” is maybe the best episode of the season, but it doesn’t come without its fair share of complications when it comes to what it means for the future of The 100. Diyoza to Clarke: “It’s hard to keep track of whose side you’re on.” Amen. It’s a little too easy to have Madi be the mouthpiece of wisdom to fix some broken relationships, but I’ll take it because it gives us some truly needed resolutions. Both Abby and Emori refuse to leave the men they love behind. Bumpy roads for each couple, but their love endures. I love the touch of Bellamy not giving Octavia a completely clean slate. They’ve both come too far for that. Once again, thank you so, so much for reading these reviews each week and giving me a lot to think about with your own thoughts. It’s been a wild ride since the second season, but I’m having so much fun, and I’m ready to do it again next season. May we meet again.